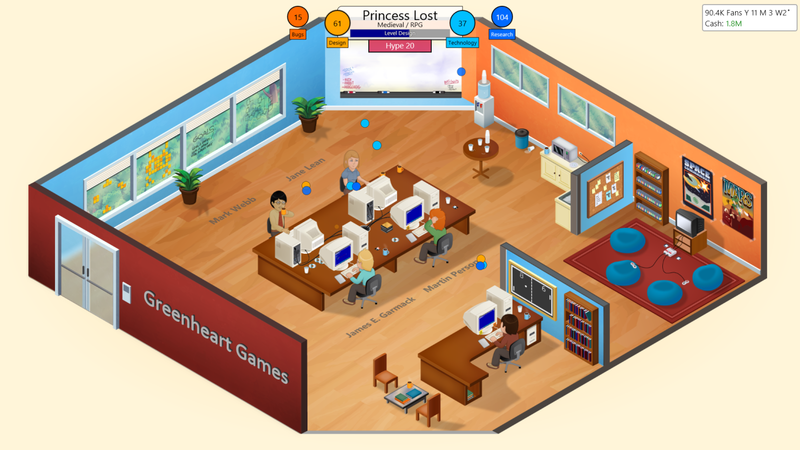 Game Dev Tycoon is sim game, designed by Greenheart Games, that revolves around you creating video games. Youstart off working by yourself in your garage, and eventually work your way up to a large office with multiple employees, creating video games along the way. Each game you create is scored, just as in real life, on a scale from 1 to 10. Depending on how well it is scored, the better the game will sell. Other factors increase the sales you make, such as marketing and the amount of fans you have. This game is flawed, however, in that you can go from making a game that receives 10s and 9s across the board, but the very next game is scored 1s and 2s. This is because of how heavily this game is based on RNG (random number generator). There is no way around this. In other games that have RNG systems, such as FTL: Faster Than Light or The Binding of Isaac, you can thwart the RNG by making good choices at the crucial times. 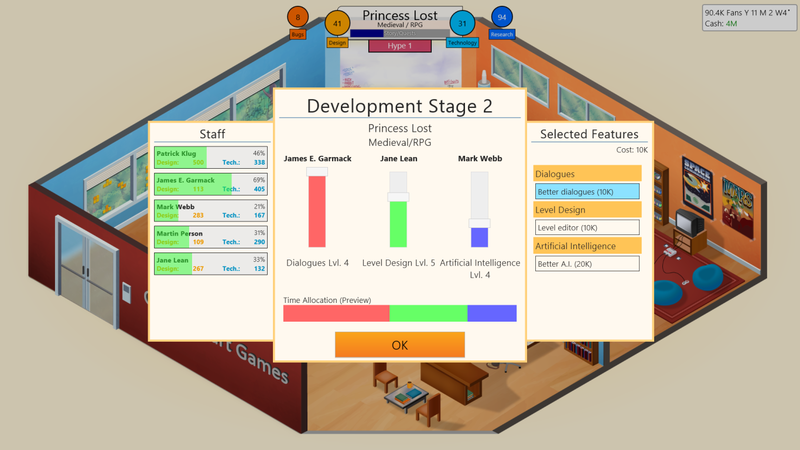 However, with Game Dev Tycoon your options are very limited. The Garage you start in. 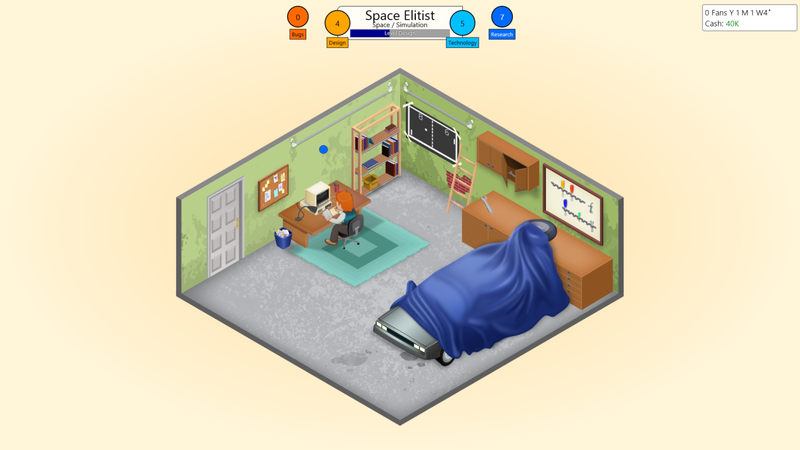 I’ll run you through the typical process of designing a game in Game Dev Tycoon. You first start by selecting a name, the name has nothing to do with the scoring or sales of the product. Unless however, you don’t set a name from the default. If your game is named “Game #13,” the reviewers will mention it, however “Game” is okay to use. Moving on, you are next asked to select a genre for your game. When you start a new career your options are limited here, but as you progress through the game your options will expand. Selecting a genre is crucial, as it can directly related to what genre is hot right now, or what genre best goes with the type of game. The type of game as in the gameplay style (RPG, Strategy, Action, Adventure, etc. and later given the options to include more than one) is chosen in a similar way to the genre, and more unlock as the game progresses through research. Again, a hot genre produces higher sales. For instance, in the game I played Military genre mixed with Strategy was great combination, and it usually garnered good reviews, and it was boosted more when people wanted to play Strategy games. I think that the combinations are different for every play-through, however I cannot confirm this. The offices you will eventually get to. After you have chosen those options you are asked to choose a game engine and the graphics. The game engine is something you create, and it contains multiple facets that make the game better. Such as, a save system, cut-scenes, day/night cycles, etc. The options for the engine is unlock through research, as are the graphics. Graphics range from text to 2D, and 3D. In my experience, all three got me good reviews and sales, so choosing 3D does not seem to be the best method. Lastly you are asked to decide which system (PC or console for the most part) to put it on. Putting it on a console requires you to purchase rights, whereas PC is free. Now the game gets on with the creation process. There are three steps during this process and you are asked to do something at each step. There are three sliders that pop up asking how much time you want to spend in a part of game. For instance, how much time do you want to take design the levels, or the dialogues, or the world design. The time spent can have a negative or positive outcome on your game, however I had a hard time discerning how to pick the best options for each step. Choosing to spend more time on level design on two game, produced different results for each. These steps seemed arbitrary and half the time I just threw the sliders in different directions hoping for the best. During the development process you are awarded creativity and design points. The more you have in each, the better the game. You also produce bugs, which are negative to the development of your game. While your character is designing the game you can also start a marketing campaign to gain interest in your game. This will increase the sales, but has no effect on the reviews. At the end of the development process you have the option to release the game. At this point your character works out the bugs, and sometimes you get some technology and design points during this time. However, the longer you spend the more people get disinterested in your game. So, it is best to release the game as soon you bug score reaches zero. Every once in a while a random event will happen, such as a reporter will want an interview, or a games convention is coming around, or even the potential sabotage of a rival company. These events are helpful, but sometimes come at poor times. Then, you release the game and the RNG starts up. Most of the games I released averaged a score of 5, and I didn’t know how to increase this score. I tried a lot of things, I released games with low design and technology scores, I released games with the opposite. I released games that were hot at the time, and every time the scores were all over the place and there was no consistency. The RNG for this game is too aggressive and it makes for a flawed game over all. Overall, I did not like this game. It is a good idea, but it is not design to the best it could have been design as. It has, and I’ll say it again, a flawed design. In other words: great idea, poor execution. It it had a less aggressive RNG, I could find some fun out it, but as it stands, it is not fun. Perhaps maybe this game could have used some more design points? I see the problem now, I will try to remedy it in furture posts. I will either add more photos, or try and space out the text a bit more. I happen to like this theme for the site, but I could always try and find a different one. Thank you for reading my article. I’m going to take a note of your site and keep checking for new information about once a week. I opted in for your RSS feed as well.